About 98 million people were under heat advisories or warnings on a sticky Independence Day. NBC New York reported that the demonstrator, identified by the National Park Service as Therese Patricia Okoumou, 44, of Staten Island, said she wouldn't come down until children separated from unauthorized parents at the U.S.-Mexico border were reunited. Authorities who scaled the base apprehended her shortly after 6:30 p.m. The activist group Rise and Resist said that Okoumou was a participant in a protest at which members of the group unfurled a banner at the base of the monument but that she acted on her own. 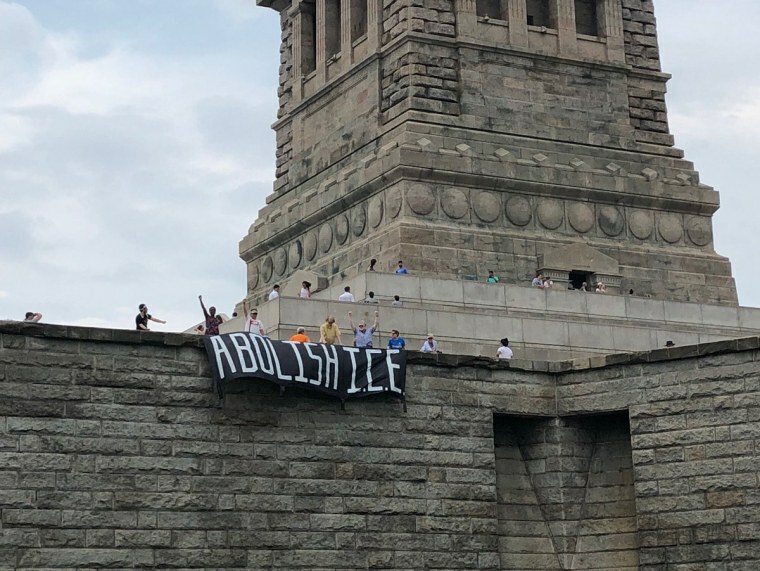 The banner read "Abolish ICE," a reference to a movement to eliminate U.S. Immigration and Customs Enforcement amid criticism of its crackdown on undocumented immigrants. "We understand and share her desire to see the immediate release of children from detention and reunion with their parents," the group said in a statement. Members of the New York Police Department's elite Emergency Services Unit said at a news conference that they've conducted rescue training on the statue but that this operation was difficult because "there was nothing for us to grab" for stability, said Detective Brian Glacken, one of two officers who first made contact with Okoumou. "She actually apologized to Chris and I for having to go up there to get her," he added, referring to Detective Chris Williams, the other officer who first contacted the demonstrator. Williams said: "We train all the time, constantly. We had nothing to worry about." The Dollar Ridge fire is the largest of several fires burning across the state. On Tuesday, Gov. Gary Herbert warned residents on Twitter not to light any fireworks on federal, state or unincorporated land because of "extreme fire danger" in the state. On New York's Coney Island, reigning champ Joey Chestnut handily won the annual Nathan's Famous July Fourth hot dog eating contest by downing 74 frankfurters in 83-degree temperatures that felt like 91 degrees, according to the National Weather Service. In Washington, D.C., where Wednesday's highs were forecast to be in the low 90s with a heat index around 100, free performances and a fireworks show on the National Mall were going on as planned. President Donald Trump wished America a happy birthday in a tweet that read, "Happy Fourth of July....Our Country is doing GREAT!" He later tweeted a video message in which he praised the country's founding fathers, who "forever changed the course of human history."